Sremski Karlovci Backgrounder: Sremski Karlovci is a municipality in the autonomous region of Vojvodina, situated on the bank of the River of Danube. Serbia has many quaint towns which are unique in their own ways. Sremski Karlovci is only a few kilometers away from Novi Sad with two routes available for tourists curious enough to venture the distance to this quaint special town. Sremski Karlovci is the spiritual, cultural, and educational town of Serbia and has been for well over 200 years. Fun fact: Sremski Karlovci used to be home to a Roman fortress, and it was not until the early 16th century that it was taken over by the Hungarian Empire, only to have it once again conquered by the Ottoman Empire and occupied for more than 150 years. In order to end hostilities between the Hungarians and the Ottoman Empire, the latter seceded this territory to the Austr-Hungarian empire and marked the slow decline of the Ottoman Empire in 1699. Tourist zone: Sremski Karlovci is notorious for its vineyards. The town has a total of 17 vineyards, of which Vinarija Kiš is the eldest dating back to 1830. 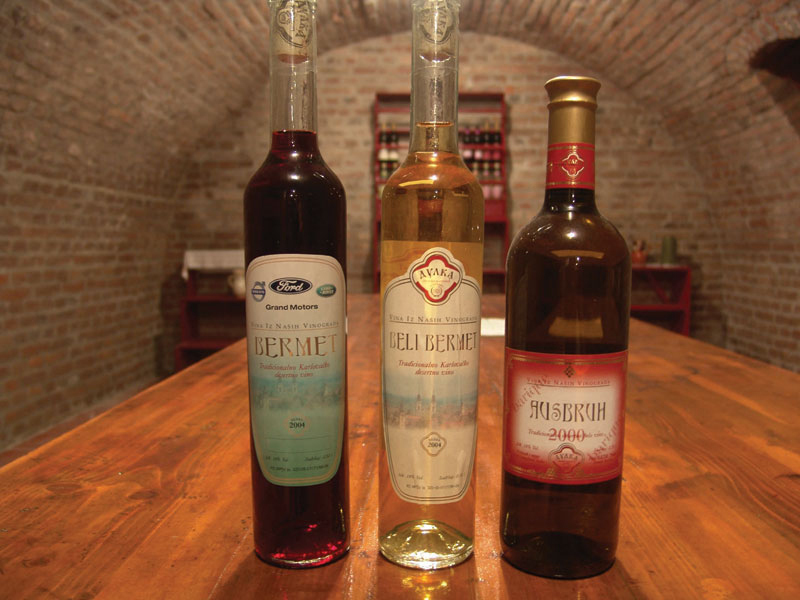 (For the full list please consult the Sremski Karlovci website) The owners of the vineyard have been growing wines for generations and they continue to develop their most well-known Bermet wine (red and white) along high-quality wines such as Chardonnay, Riesling, and Merlot. If you are anything like me you will not be able to restrain yourself from buying a bottle as a souvenir. Gone are the days of buying magnets as souvenirs, time to fill up the suitcase with exotic wines from sensational places. Another great thing to do while in Sremski Karlovci is to ride the Romantika (Romance) train that begins in Belgrade, so if you are bringing your special other on this trip (warning: he may not like you buying a bottle of wine as a souvenir, my boyfriend didn’t) then this is a great date ride for the both of you to enjoy the scenery and perhaps uncork that bottle of wine and enjoy the delicious desserts you grabbed along the way. Belgrade Backgrounder: This summer I had the opportunity to travel to Belgrade for three days and I was looking forward to visiting all the hot spots of this wondrous city especially after I had been reading up on how archaeologists had unearthed remnants from the Roman Empire throughout the nation. Belgrade is a city with a rich history dating back to the Paleolithic era, 40,000 BC. Thereafter the territory of Serbia was within the boundaries of the Roman Empire and had produced 17 emperors within its territory. Of those the most notable was Constantine the Great whom was most acclaimed for the establishment of Christianity within the region. Following the Ottoman conquests in the Balkans Serbia and Belgrade would be under the rule of the Ottoman Empire for nearly four decades. It would not be until the First and Second Serbian Uprisings where defiance would prove advantageous for the Serbs and yield autonomy against the Turkish Ottoman Empire. Nevertheless,in order to gain full independence from the Turkish Empire would require the Serbs to ally with Russia to confront the Turkish Ottoman Empire in the late 1870’s. Thenceforth, Serbia gained its independence and was known as the Kingdom of Serbs, Croats and Slovenes, and the rest is history. Wander the beautiful curvy streets of Belgrade while staring in awe at the beautiful architecture of the buildings comprising Old Belgrade (See images below). 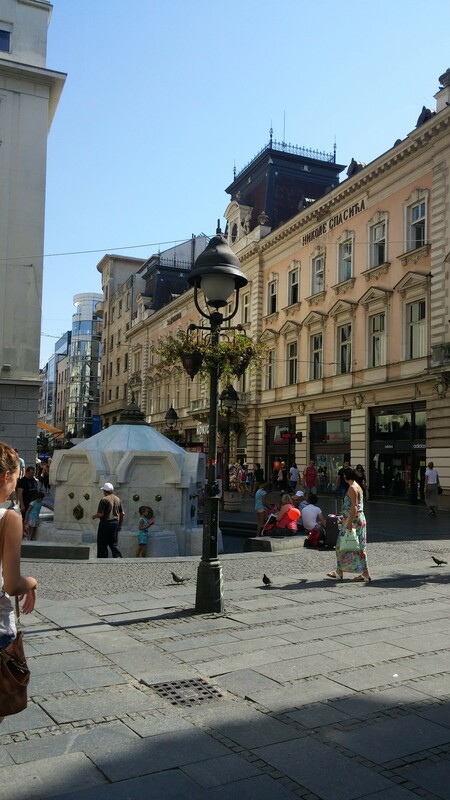 The infamous Knez Mihailov street which resembles a piazza in Venice or Florence with its width, amiable atmosphere and decorated with cafes and restaurants right, left and center. This is also the tourist hot-spot where you can hear a multitude of languages as passersby admire the scenery while shopping at some of the most lavish stores featuring brand names from across the continent as well as the United States. Sadly, you will not find any Roots stores in the vicinity. The fortress Kalamegdan is a sight to behold. 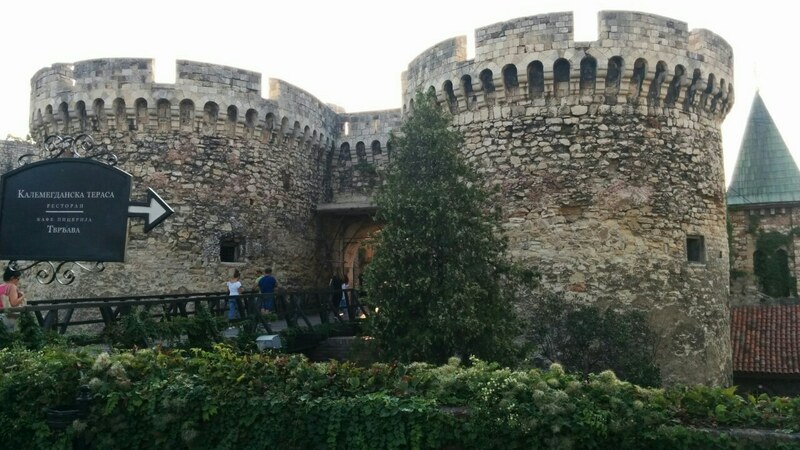 It is the oldest historical landmark in Belgrade, built before the Roman Empire. 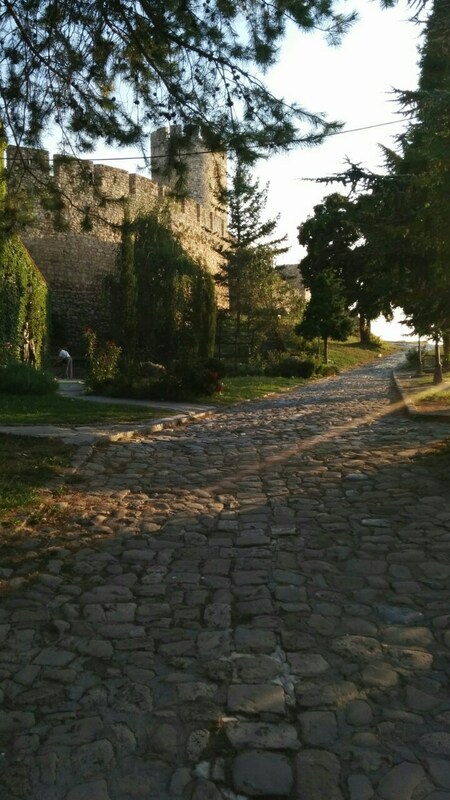 The fortress has a beautiful view of New Belgrade and go see the Pobednik (Winner) statue while admiring the view of the amalgamation of Sava and Danube rivers. The fortress is mostly a park comprised of cafes, sports courts, as well as an artillery museum and observatory. If you are looking for a really upper echelon place to party it up with your friends, the “Kalamegdanska Terasa” located on Fortress is your best bet. At night this restaurant is transformed into a club spinning the hottest EDM tracks all night long, and when I say all night I mean beyond the Canadian two a.m. limit. For all you foodies (including myself) who restaurant hop whenever visiting a new city, the restaurant “Manufaktura” is one of the best restaurants to indulge in traditional Balkan dishes. The restaurant has a very warm atmosphere with exceptional staff members. They have the widest variety of ethnic dishes of all restaurants which I have eaten at. In addition, for some ethnic Mediterranean food one of the best restaurants is “Restoran Dvoriste.” This restaurant is hidden from the bustling crowds of Belgrade and has a patio that makes you feel as if you are in Greece and not in Belgrade. For both of these restaurants you will not need to dig deep into your wallet as they are both reasonably priced with hearty portions. Nevertheless, they are both chic restaurants, so no sweatpants and sweaters allowed. The people of Belgrade are known for their savvy fashion sense, and they never walk out of their homes in pajamas either, shocking, I know! 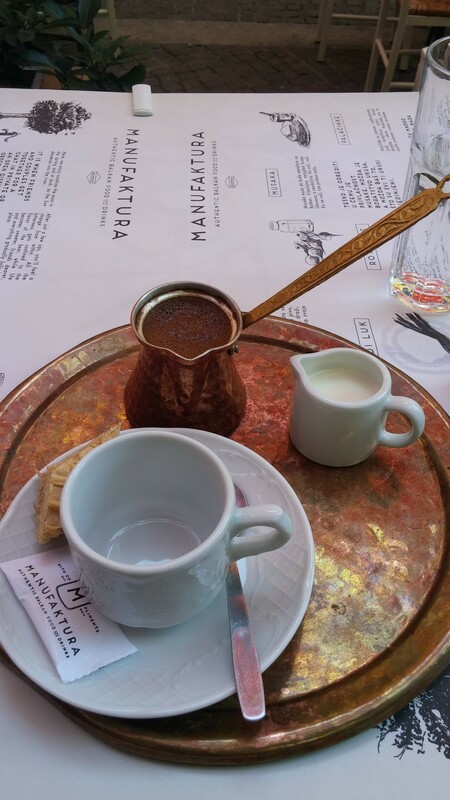 Manufaktura – Turkish coffee is served. For all the historical and political junkies (you are not alone) the best places to satisfy your intellectual cravings is by going to visit the National Museum of Serbia (1841), the National Theatre *1869), and the National Library (1832). For all you hipsters looking for vintage yet trendy pubs and bars, all you have to do is walk along Skadarlija street and you will be surprised by how popular the bohemian style is to Belgrade citizens. 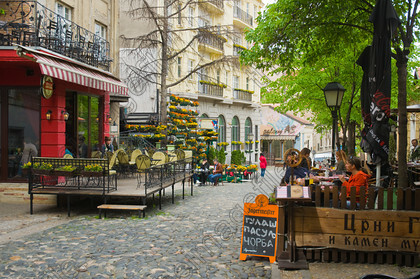 This area is also where you will bump into some of the most gorgeous people of Belgrade. I went to one cocktail bar, unfortunately, I was too busy gawking at the cute boys inside this bar to actually remember the name of it. Lastly, the infamous “splavs” of Belgrade are what have made Belgrade’s reputation of being a city with the best nightlife. Remember to always carry flats can fold into your purse, because when going partying with locals do not expect to be crashing early, these parties last until sun rise. The most visited splavs are docked on the Sava river opposite the Belgrade fortress with a stunning view of Old Belgrade at night. Now to address the common misconceptions of Belgrade:It is not a dangerous city, it is safe as long as you are not looking for trouble, if you are you will find it as in every city. There is a common misconception that travelling to Serbia and Belgrade will be akin to travelling to a war-zone territory. This is utterly false! Serbia as a whole has so much to offer tourists and those open-minded curious souls. 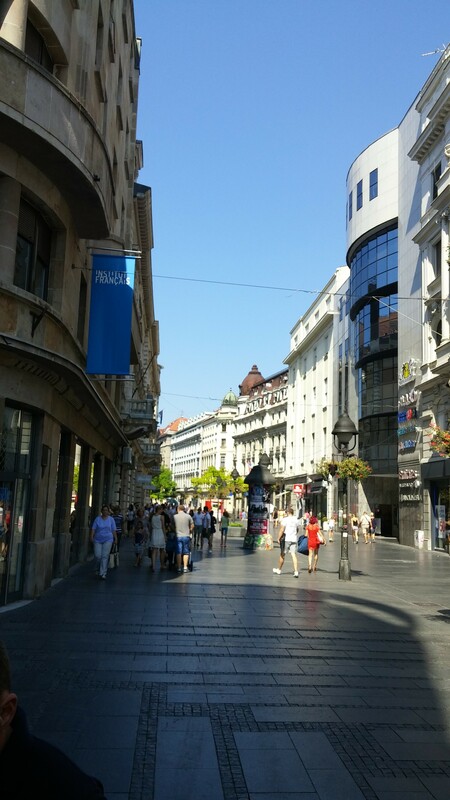 Yes, there are a few remnants of collapsing buildings after the city of Belgrade was bombed, however Belgrade has been fully restored to a metropolitan city. Therefore, I urge everyone to experience a taste of Serbia by visiting Belgrade, you will be amazed!